Texas horned lizard photo was copied on 09/19/04 from Texas Parks & Wildlife Department's website: www.tpwd.state.tx.us (all rights reserved; used by permission). Neither this website, nor the information presented on this website is endorsed by the State of Texas or Texas Parks & Wildlife Department. Horned lizards can have an intimidating appearance but are docile and gentle in nature. When a horned lizard feels threatened, it flattens and freezes in place, trying to blend with the ground. Texas now lists this unique animal as threatened. Ancient native Americans of the Southwest (the Anasazi and the Mimbres) depicted horned lizards on pottery and in petroglyphs. It was a symbol of health and happiness to native Americans. In recent times, the horned lizards' habitat has shrunk, imported fire ants have supplanted their food supply, and their numbers have declined drastically. The horned lizard is no longer seen in many regions where it was once common. 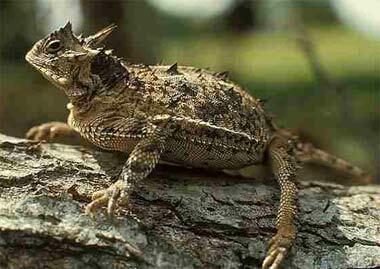 Two of the three native Texas species of horned lizard are now listed as threatened (Texas horned lizard and the mountain short-horned lizard).